As previously reported, "Rise of the Apes" will follow a driven scientist (James Franco) who is desperately trying to cure his father's Alzheimer's disease. John Lithgow will play Franco's father. The subjects Franco's character is testing a cure on is (of course) apes and instead of a cure he ends up creating hyper intelligent chimp named Caesar. Freida Pinto will play a primatologist that most likely works with Franco trying to protect Caesar from cruel scientists. I really like the casting 20th Century Fox and director Rupert Wyatt have landed thus far. Lithgow is a master. James Franco continues to impress with range and Freida Pinto should compliment him nicely. My biggest problem with this movie is the fact it really is a prequel to a prequel. Actually it is not so much a problem but a concern. This movie intends to be the origin to the Planet of the Apes franchise, it will only lead up to the onset of war between Ape and Man. I am not so sure how well fans and audiences will react to that. A similar approach was done with Robin Hood this year by director Ridley Scott and it opened to mixed reactions. There is also no telling whether 20th Century Fox will continue with further sequels and even a possible remake of the original franchise. 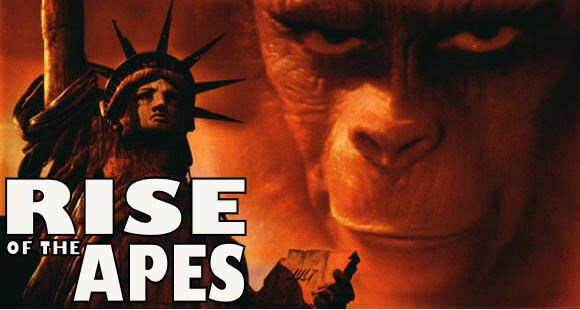 Stay tuned for more on "Rise of the Apes" which begins filming next month in Canada as is set to release next Summer on June 24th, 2011.